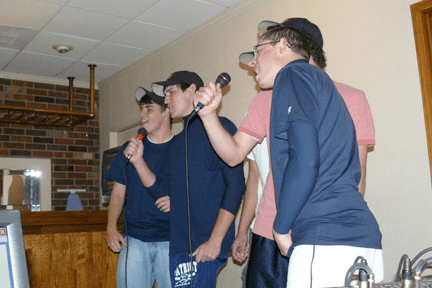 Be it at a club, bar or private party, who doesn’t love an evening of karaoke? Time to call Crunk DJ for an awesome experience! We have thousands of your favorite musical hits from the 50’s through today. An on-site database is available so you and your guests can choose your favorite songs to sing . The instrumental music track and “singer’s voice” will be played through our on-site complete sound system. Our 32″ screen lets you easily see the lyrics. Our wireless mics greatly reduce the past abundance of cords and sounds great. Whether your venue holds 20 or several hundred, rest assured we have the equipment to make it rock and the MC to make your show a huge success. Our karaoke show is perfect for private parties and suitable for all ages, even the youngest attendees enjoy the music. At your home or venue you can sing the songs of your choice and we will keep your family and friends entertained! If you own a club or bar we are the premier karaoke provider in the area! Our extensive database, our premium sound system, our experienced MC’s will make our show worth your money. We preform regularly in Kentucky and would love to have you join us! You can follow us on our Facebook page to find out when our karaoke show will be near you. Seeing a live show is a great way to preview our performance for your party. Your party is special, why not let us do our part to make it even more fun! From the music to the MC and sound system, we have 15 years of experience in Henderson to Hopkinsville and every town in between. Evansville and New Harmony in Indiana, Princeton, Paducah, we can be there! Waiting to hear from you, call or use the contact to let us know when your party is!